FROM HOUSE OF FRAZER. FATHER CHRISTMAS ON HIS SLEIGH WITH LITTLE PENGUIN. Heavy Glass Globe on Ceramic Base appx 5.5 ins High. "PLAYS WE WISH YOU A HAPPY CHRISTMAS ". Antique German Hertwig bisque windmill Christmas cake decoration. Very good antique condition. Remains of coloured glittering still attached. Impressed number to base ~ obscured by glittering. A cracking Christmas show stopper! An essential Christmas table decoration this year. 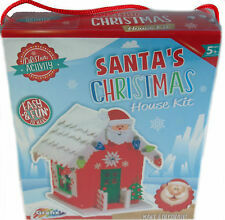 Grafix Build Your Own 3D Foam Christmas Santa House Craft Kit Toy. Great Little kit to keep the kids busy this Christmas! Set Contains; 14 foam shapes, 67 foam stickers, 3 rhinestones, 1 tube of white glue, 1 packet of glitter. Everything you will need in one set to complete your very own santa house! Excellent gift. 5 years . Luxury Ceramic Glazed Snowman House. Tea Light Candle Holder 22cm. Beautifully finished ceramic Snowman with cut out windows, doors and star design to allow the natural light of an added candle to shine through. Tea Light Holder. Beautifully finished bright red hose with cut out windows and door, with a cheery Santa. BT (Northern Ireland) IM (Isle of Man) & Channel Isles. This pretty tealight holder is created in that most nostalgic of classic sweet delights – a gingerbread house! Tealight not included. Die cut tree design with Reindeer to front. Great as decoration or night light. Light up House shape box. LED Lights in Warm White. Can I have my order faster?. Required 2 x AA batteries (not included). When against the wall it'll create a superb backdrop for your photos at your Christmas party. Easy to put up using Blue-Tack or similar product, these pieces are used together to create the look. Great for use indoors and outdoors these create a fantastic Christmas scene. ELF SURVEILLANCE PLAQUE. Ensure the kids are well behaved this season with our fun and fabulous Elf Surveillance wooden sign. Size 15cm x 10cm x 0.6cm. Christmas Winters Scene. Large Light Up LED Hand Crafted Wood House & Stable. Beautifully hand crafted wooden house with snow dusting on the sloped roof, with artificial greenery and berries. Rustic Elf Surveillance sign. Material : 5mm depth Birch ply (FSC Certified) & Ribbon. (note ribbon colour may vary). Laser cut and engraved. Designed in house. Even with the lights off, these beautiful houses are stunning to observe. They're also excellent for anyone building a seasonal pixie or fairy garden! Christmas Tree Elf House with Lights. There is a variety of designs and styles available. Candle Bridge Size: 32cm. Pine Wood Bridge with 5 Candle Lights. Have the sweetest looking house with these Gingerbread Clings. The vinyl decorations use static to cling to the windows and can be easily removed and used again next year. Gingerbread House Vinyl Window Decorations. Elf on the Xmas shelf prop. They can be used with the toys or barbies alike. Unique Elf / doll / Barbie house Christmas Eve plate. One of a kind and worth every penny. Elf and other accessories in pic not included. LED House With Fiber Optic House. Warm White. LED multi-coloured. Children Motion. 18 x 11 x 14cm. They can be used with the toys or barbies alike. Can be used on barbie dolls or Elf Christmas fun. Barbies and elf’s not included. Bring the magic of Christmas to life and delight the children with the tale of finding one of Rudolph's Flying Shoe's in your garden. Shoe is approx 20cm tall 10cm wide. 'This House. Believes' Wooden plaque. Candle Bridge Size: 32cm. Sitting on a wood base with Houses that light up too. Pine Wood Bridge with 5 Candle Lights. Can I have my order faster?. Calendars / Diaries. Requires 2 x AA Batteries (not included). LIGHT Up Christmas House Ornamento. Santas Workshop verde con pupazzo di neve. Very rare Christmas Frosty's Snow house By Leonardo place a candle inside to light it up. YOU ARE BUYING SANTA CLAUS HEAD TOILET SEAT COVER INCLUDES SOFT TOILET SEAT COVER WITH SANTA HEAD DESIGN AND FURRY BEARD SIZE GUIDE ONE SIZE FITS MOST PERFECT FOR GREAT NOVELTY SECRET SANTA GIFT! PLEASE VIEW OUR EBAY SHOP HERE FOR OTHER FANCY DRESS OUTFITS / ACCESSORIES. Christmas Decoration - House LED Animated Musical Scene with Children, Santa with Parcel Sack, Snowman and Bridge. LATE/MISSING PARCEL. Can be mains adapted - supplied. Can be played with or without music. Contains Flashing & slow colour changing lights. Battery Operated. Novelty Light up House. Requires: 2 Button Batteries AG13 (Included). Can I have my order faster?. Calendars / Diaries. Suitable for indoor use only. Ending Soon. > Christmas Trees. > Christmas Lights. > Christmas Decorations. Prefer to talk?. Opening Hours Just give us a call! We can then arrange to have the item replaced if necessary. This House Believes hanging plaque. Christmas Plaque. Perfect for getting into the Christmas Spirit. Once placed inside the Holder, the Tea-Light will illuminate the House from the inside creating a lovely soft glow. A simple yet effective addition to your Christmas Decorations. Also brilliant for placing in the window and creating that lovely festive glow.